“You never know where it will take you” is often said of exotic jobs, but part of the enjoyment of being a Cambridge wedding photographer is I know sometimes EXACTLY where it will take me. Our Lady and the English Martyrs Catholic church is a very popular location for weddings and also a personal favourite as I’m a Catholic myself. When Natasha & Matt contacted me to photograph their September wedding and said Our Lady was the place, I knew I was in for something special. The bride and bridal party prepared at Natasha’s Mum’s house in Haverhill. The ladies were festive, emotional, reflective – photographing in the family home highlighted a delightful personal context to the events. It’s very special to be an observer among close friends & family on such an occasion, I was able to take many elegant, poignant and touching candid and posed photos to capture these moments. Especially the father-of-the-bride first sight of his daughter in her wedding dress, a very emotional moment! The groom and groomsmen prepared at Rectory Farm, also the site of the reception. Matt is American and against all decency allowed Budweiser beer (is it really beer?!?) to be passed around freely. How did this get through customs? A shameful start but lads will be lads, the pictures from Ashley Carter who was my second shooter preserve the evidence…! Our Lady and the English Martyrs church is one of England’s most beautiful churches and it’s an inspiring setting for a day of celebration, romance and splendour. The towering stained glass windows and cooperative weather made for magical, almost mystical light inside. The blend of English and Americans was very Four Weddings and a Funeral! The spacious church allowed numerous vantage points to capture the entrance, ceremony and kiss. The fanfare of rose petals as newly married Natasha & Matt departed was SPECTACULAR! 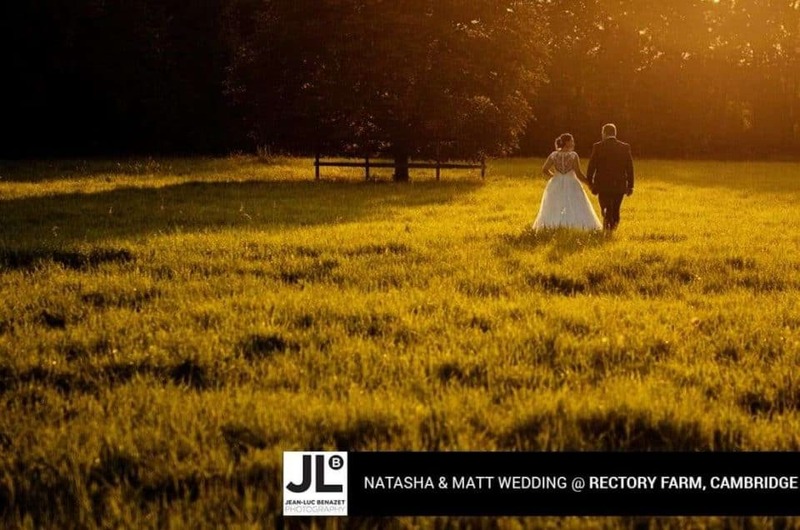 Rectory Farm is a STUNNING setting for wedding photography. It’s a beautiful house on the outskirts of Cambridge, you can see from the photos there’s a lot of space and a very rural, naturally beautiful look to the place. As sunset approached, I took everyone to the long grass field behind the marquee and got some wonderful photos: very romantic light, lots of background foliage and encroaching shadows that added texture and drama. I relish being a Rectory Farm wedding photographer and weddings there are among my favourites! The reception and evening entertainment were predictably raucous – this is a fun group! With the hard part done, this was the group’s time to let loose and I was happy to preserve on film some moments that otherwise may not have been remembered the next morning! Everyone helped Natasha & Matt celebrate a wonderful day, partying and dancing the night away. Why must these wonderful occasions end…? Thank you, Natasha & Matt, for letting me be part of your special day and choosing me to record and preserve these memories. It was a joy to spend the day with you and your exquisitely fabulous family and friends! Are you having a Cambridge wedding? Please get in touch with me. For 19+ years I’ve been a Cambridge and Rectory Farm wedding photographer, I’d be happy to talk with you about how to best capture the memories of your very special day.